Vitamin C is an amazing ingredient for skin. It’s antioxidant, brightening, and visible firming abilities are well supported by published research, especially for ascorbic acid, known as pure vitamin C. That’s why we chose ascorbic acid as the lead ingredient for our Paula’s Choice Skincare C15 Super Booster, a customer favorite for all skin types, all ages. C15 Super Booster blends 15% vitamin C with other potent antioxidants that not only benefit your skin, but also help keep the vitamin C stable. Although ascorbic acid is impressive, it’s also the most vulnerable form of vitamin C. It can quickly lose its effectiveness if the proper formulary and packaging steps aren’t taken. We take the steps necessary to overcome this issue so you can be sure you’re getting a wonderfully effective product. Dispensed via a dropper tip applicator (with a special air-restrictive stopper inside the bottle), this water-light fluid is formulated to quickly absorb into skin’s surface. Once absorbed, the vitamin C, other antioxidants, and replenishing ingredients work to help undo the visible effects of environmental damage. Vitamin C is considered among the best antioxidants for this purpose. Left unchecked, this damage keeps building, leading to skin that appears dull, uneven, wrinkled, and generally unhealthy. 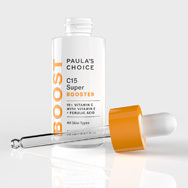 C15 Super Booster steps in to revive radiance while visibly firming and brightening skin. Not bad for just a few drops applied as part of your daily skincare routine! It’s hard to put into words all of the great things C15 Super Booster does for skin. In addition to the benefits mentioned above, this booster seems to have an impressive ability to make skin look better in every possible way. From our own experience and customer feedback, we’ve seen skin that looks younger. Fresher. More vibrant. More … everything good! Knowing how vitamin C works to improve skin is nice, but seeing the results on your skin is even better. We’re thrilled to be able to deliver its benefits—and those of its supporting ingredients—to you in a booster that can also be used with any other product in your skincare routine.